Looking for a firm supportive mattress with a touch of softness on the surface? Our Pure Performance Cozy CUSH features our five-zone natural latex performance core which offers progressive support and optimum firmness which we then top with a softer 2" sculpted layer of natural latex on the surface to add a touch of cushioning. This added layer of soft sculpted latex is beneficial to sleepers that really want a firm mattress but need just a soft touch of surface comfort to buffer body curves from the direct firmness of the core. To provide a slightly softer surface, the Cozy CUSH features a 2" layer of softer sculpted latex on top, above the core, for cushioning that still provides optimum support but helps buffer the firmness with a touch of gentle yielding. Our zoned latex cores and toppers are made to our specifications from 100% natural rubber with no synthetics or fillers using the time-tested natural Dunlop process which has proven to out-perform anything in terms of longevitiy and durability. Although heavy and dense, it does not have any fillers often associated with Talalay, nor does it have any chemicals or petroleums used with synthetic latex. #1 - Add another soft layer of latex (for a total of two layers) if you should desire to make the mattress a little more soft. This will give the mattress a more tight-top feel because of the constriction of the components. It will make it softer without the worry of feeling too soft. #2 - For folks that want to add plush luxury, consider adding our Natural Latex LaNoodle Cuddle Top. 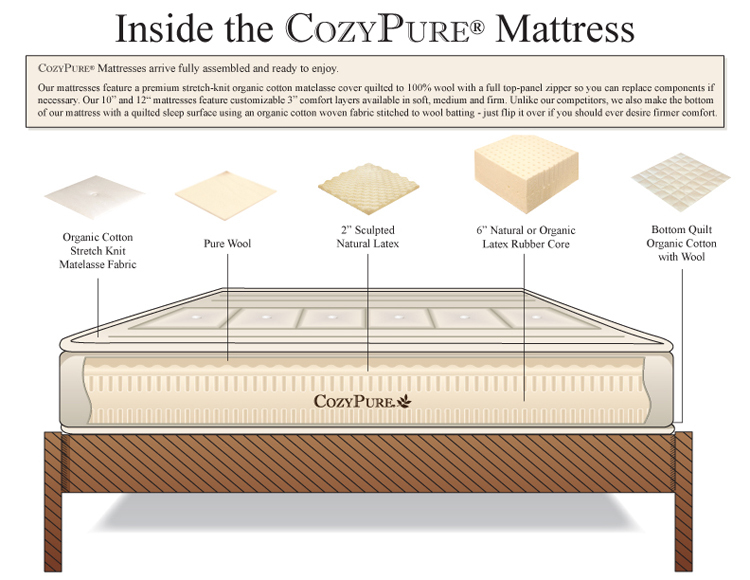 #3 - You can also combine both #1 and #2 -- add a second layer latex PLUS add the Cuddle Top (this will give you the softest configuation possible for this firmer mattress). #4 - If you should ever desire the CozyCush to actually be a little firmer, simply flip it over.